Dr. Smith is an applied avian ecologist who’s research aims to evaluate the effects of global change on the spatial ecology, demography, and behavior of birds and, on occasion, other taxa. Her research often takes a mechanistic approach using various techniques, including field observations, experiments, and statistical and geospatial analyses. 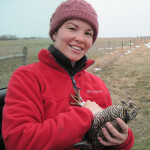 She is interested in both basic questions concerning life-history trade-offs and species distributions, as well as applied questions pertaining to land-use and management scenarios that inform policy and promote sustainable land uses that consider the conservation of wildlife and human well-being. She is currently an Assistant Professor in the Department of Environmental Science and Ecology at the University of Texas at San Antonio.